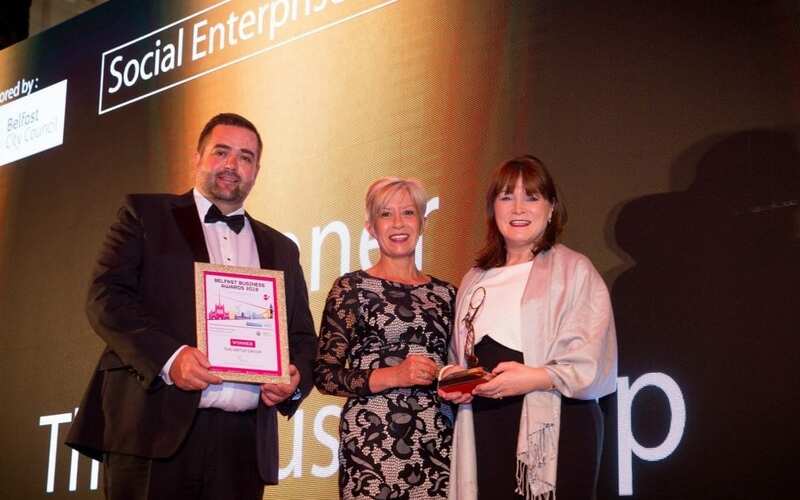 The Ortus Group are delighted to announce that it has been recognised as the Social Enterprise of the Year at last weeks (27th April) Belfast Chamber Belfast Business Awards held in St. Anne’s Cathedral. The Belfast Chamber Belfast Business Awards are a celebration of the positive work of businesses across Belfast. Attended by over 400 individuals, there were 22 categories, ranging from retail, hospitality, digital marketing, sustainability, family-owned and individual awards. The Ortus Group was set up to encourage new economic activity within the Falls/Shankill interface area of Belfast. This year celebrating 30 years since company origins, Ortus is the largest enterprise agency in Northern Ireland and, through a range of innovative programmes, have successfully assisted hundreds of SMEs. Consisting of 6 enterprises including brand new Roar And Explore Soft Play, all profits are invested back into the group for social and economic regeneration purposes and the group receives no external funding. “We are absolutely delighted as a team to be named as Social Enterprise of the Year at the Belfast Business Awards particularly in our 30th year of business. At Ortus our social giving is central to our ethos achieved through initiatives such as direct donations to local community and voluntary organisations, working in partnership with local influential groups, educational bursaries and community and charity events. Annually we assist more than 400 individuals with their businesses across our programmes including £40,000 worth of free business support and mentoring to local SMEs. We are also innovating and enterprising in all we do. In 2017 we launched social enterprise – Roar and Explore Soft Play at Dairy Farm Shopping Centre with several additional projects planned for 2018 focussed on growing the business but also local employment opportunities and social impact.